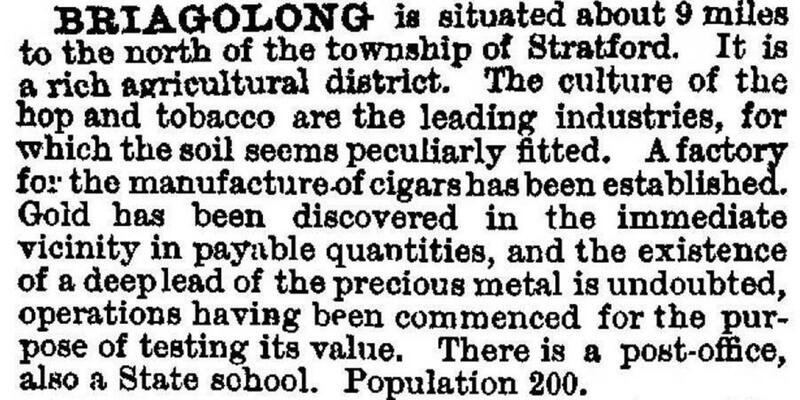 The township of Briagolong is 14 km north of Stratford in Gippsland and about 270 km east of Melbourne. It is situated on flat open red gum plain, close to Freestone Creek with the Great Dividing Range to the north. The district was part of Angus McMillan's Bushy Park run, this area being known as Top Plain. Land was selected at Top Plain in 1866, after the Amending Land Act of 1865 was passed. The 42nd section of the Act allowed selection of four 20 acre blocks provided the land was within ten miles of a recognised goldfield. Miners had been prospecting on the Freestone Creek, and gold was found in small quantities. By 1868 many claims had been taken out along the Freestone Creek and its tributaries. For a while there were 200 miners on one named Maximillian's Creek. A small settlement named Gladstone sprang up in this valley but was razed by a bushfire on Christmas Eve of the same year. A small number of miners continued to prospect during the 1870s. A quartz mine, the See It Out, was worked by different groups over the years but was never really successful. A local syndicate reopened it again in 1924 but it was again shortlived. Hops were planted extensively and there were a number of hop kilns in the area. The crop was most important in the 1880s and 1890s, but insect infestation caused it to dwindle by 1913. Tobacco was grown from the late 1860s. Disease ended this industry in the 1940s. Fruit growing was also an important activity. The first orchard was planted in 1867 and fruit was exported to London in the 1890s. An orchard of cider apples was planted in 1886. From the 1880s several vineyards were planted and wine produced. Sugar beet was tried but not continued. Large acreages of wheat, oats and barley were grown on the drier land. There have been a number of apiaries in the district. The most well known beekeeper was Tarlton Rayment, who moved his apiary to Briagolong in 1913. He is the author of a textbook on beekeeping, many articles on insects and a novel based on the life of Angus McMillan. There were several small cheese factories on larger properties but the opening of the Briagolong Cheese Factory in 1873 encouraged the dairy industry. In 1889, with the coming of a branch railway line, milk was taken to Maffra twice a day by train. Cattle and sheep were also grazed. The tradition of summer grazing in the mountains was begun in the 1850s. Timber milling became a very important industry. In 1872, the Victoria Saw Mill was relocated from Stratford to Top Plain. This mill also produced kit homes, verandah posts and turned ornamental posts and during the 1880s, red gum blocks for street paving. It ceased operation in 1889 but a number of other mills have operated over the years. In 1912 one provided yellow stringybark for flooring for Australia House in London. Vast quantities of railway sleepers, firewood and wattlebark were also sent away by rail until the line closed in 1952. A quarry on Freestone Creek was in operation about 1866. Its attractive stone has been used for buildings in Sale, Stratford and Briagolong. Quarry Reserve, set aside in 1896 for watering purposes, is now used as a picnicking and camping spot. The wall of freestone, which gave the creek its name, is visible in the reserve. An early landmark of the area was the Delta Bridge. As the Freestone Creek flowed from the mountains onto the plain, it spread out like a delta into a morass. A low wooden bridge was replaced by a larger bridge in 1893. Flooding and gradual widening of the creek led to the bridge eventually being about 400 feet long. It was destroyed by bushfires in 1965 and has been replaced by a concrete bridge. In 1911, Briagolong’s population was 462. In 1933, there were 393 inhabitants, gradually declining until a low point of 216 in 1976 was reached. Since then, the population has again grown until in 1994 there were 500 people in the district. The area has become popular with people who are interested in an alternative lifestyle, with stone and mud brick houses being constructed. In many ways the township is little changed. Many original buildings remain and are well maintained. The Mechanics' Institute has a National Trust classification. It is unique in that it also retains its original library. The provision of town water in 1971 from an artesian supply has greened the town. The wine industry is being re-established with two vineyards being planted in the area. In the town there are sporting clubs, a primary school (102 pupils, 2014), a large hall and three churches. There is a Briagolong community newsletter and several activities are carried out in conjunction with neighbouring Boisdale.